Very hectic last weekend. I was delighted to be asked to participate in a project to benefit the Shaker Museum and Library. I have always admired the Shaker ingenuity and sense of design. Each invited artist, along with members of the general public, was to photograph whatever they wished on the grounds of the Mount Lebanon Shaker Village in New Lebanon, NY on Saturday or Sunday. Fortunately for me, I had conflicts on both of those days and had to make special arrangements to shoot on Friday, which was a perfectly beautiful day. Saturday and Sunday were wretched – cold, rainy and windy. Most of the buildings are in poor condition, hence the reason for the fund raiser. There are the shored up walls of an enormous old stone barn, which burned down in the 70’s. There is a beautiful, peeling red carriage house with windows of old glass, filled with plows and farm implements. The only renovated building is the red granary. I was drawn to the windows of the various structures. In fact, the image I chose to submit to the exhibit is an interesting view of the campus reflected in one of the carriage house windows and through another. I will post that photograph in this blog after the exhibit – juried by Jeff Rosenheim, Curator in the Department of Photography at the Metropolitan Museum of Art – opens on June 18th. It will also be included in the exhibition catalog. 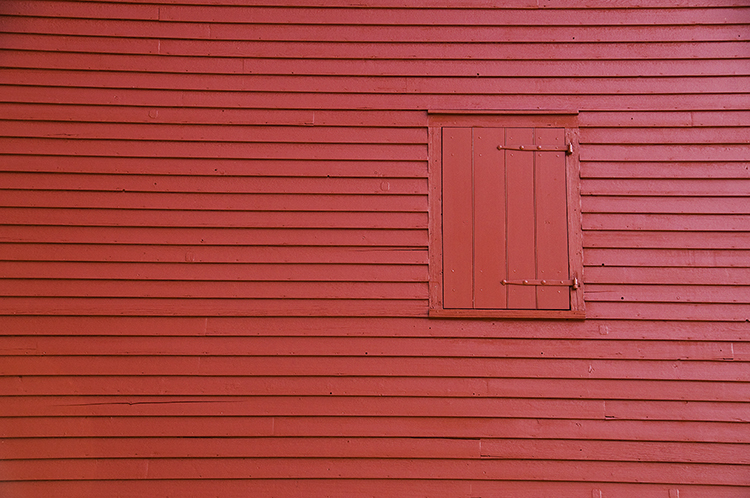 The image that I am posting here is a shutter closed over a window on the side of the granary. I love the color, texture and the architecture of this slice of the wall in the late afternoon light. Visions of Mount Lebanon, will be on display from June 18- July 3 at the Joline Arts Center, on the campus of the Darrow School, located at Mount Lebanon Shaker Village, 202 Shaker Road, New Lebanon, NY 12125. There will be a silent auction to benefit the Shaker Village at the Museum’s Sixtieth Anniversary Party on Saturday, July 10, at Mount Lebanon.